Nikon D90 was removed from the employee purchase plan for Best Buy employees as of July 21st, 2010. The D90 kit is still available. I got multiple reports that dealers (mainly outside US) cannot order any D90 cameras from Nikon (and in some cases, D700). 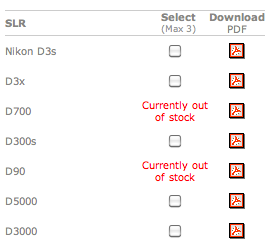 Nikon D90 must be running really low on stock right now. Target and BestBuy also don't have the D90 for sale online (they used to). This entry was posted in Nikon D90. Bookmark the permalink. Trackbacks are closed, but you can post a comment.